My Muse can be a cruel, cruel mistress. This is official notice that I’m running a short & sweet Kickstarter for enamel pins. We are currently at 30% funded before the end date of March 7th. Hey, luvs! Long time no see! What have I been up to? Oh, you know.. Working, fulfilling orders, evicting my uterus, and now 4 Kickstarters. You might remember me posting all over the place last year about Jamie Wyman’s 3rd book Etude in C# book, Uninvited, which funded with a little help of our #Satyrthon. Well, the book went out early! And I helped make these gorgeous poker chips (vines by Zach Reddy, goat and lasering by me, and Jamie and I both assembled), some of the buttons, some of the button designs, some of the posters, etc. So that’s on and out. After funding successfully, I was recruited to be the Production Ninja for next year’s Men vs Cosplay 365 page-a-day calendar, which just went to the printer this evening. That was a good healthy month of work, mostly invisible. While I was working on the fulfillment of both of those, I also helped out with the graphics and consulted for Branum Games‘ first Kickstarter – Battle Gnomes which is 75% funded with 22 days left to go. I also can’t forget that I 3d printed the VIP Enabler badges designed by Chris Impink for Intervention Con 7, which is THIS weekend in Rockville, MD and features some pretty high-profile awesome people like Alex Kingston, Gigi Edgley, René Auberjonois, Rachel Talalay, and so on. So, check them out! I hope to get a couple comics that I drew while recovering up at.. some point.. So don’t think this page is completely dead. Hope all is well with y’all! 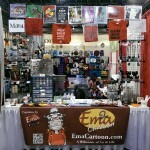 Once upon a time, vending at convention shows were a fun and effective way for artists to make money and pay their bills. Attendees came far and wide, pushing record ticket sales, spending a lot of money, and over all boosting the local economy. Then it and the economy crashed. Then it built up again. And people started to notice. More people were creating more shows in the towns where shows already existed. More smaller shows started popping up with more frequency. Even ones dedicated to the same thing. 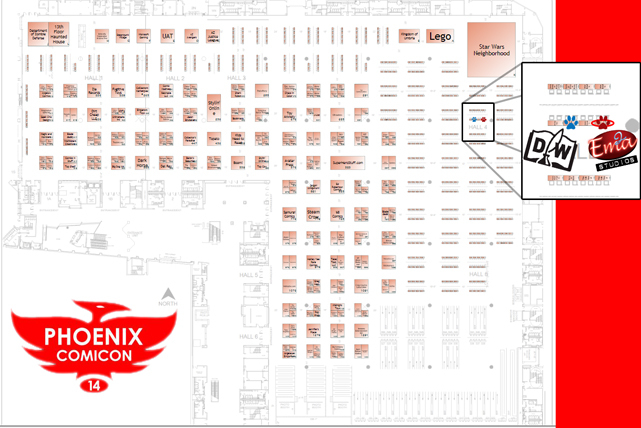 Just look at all the “comic conventions” that are in Phoenix and Dallas. When you make a show to be within 2 months of another local show within a 4 hour driving distance, you’re splitting your attendance pool even further. Come on, it’s basic business, y’all. Stop competing with each other and work together. We’re all here to make money. Look at your competition and then make them not a competition either by time or distance. Or even better, create a different kind of convention – one with a different theme. Take on the tiny shows that aren’t cutting it and have stayed tiny for over 20 years. Build something new. Make something where your audience wants to and can go to both shows. “Fan Experience” shows with under 20 celebrities are just a cop out. Strive to do better. That requires doing some market research. Good luck. It seems we’ll all need it. Where’d I go? Oh, right. 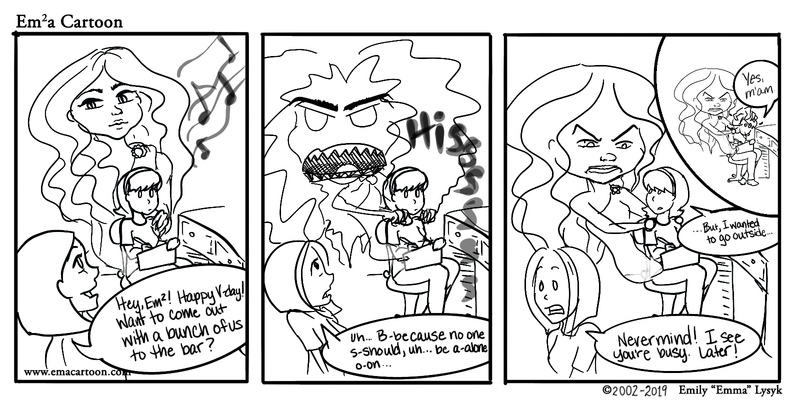 So, I kind of unofficially soft-retired Em²a Cartoon in 2014 to work on another comic called Siren’s Song (updates posted on my Patreon). If you haven’t been following me on social media (I’m stupidly over-active on Facebook and Instagram), you’d know that I’ve spent the last 2 years globe hopping, hitting up various comic conventions across North America, and laser engraving a ton of crap. Like, a lot of crap. So much that I haven’t really been able to work on that.. other.. comic. A lot of people don’t quite realize how much work goes into being an artist and/or self-employed. It’s a lot of missed birthdays, working until 3am, driving cross-country until you can’t stand to look at yet another freaking highway, and doing whatever you can to make that mortgage payment. It’s engrossing, and the worst part is – you only get out of it what you put in about half the time. So, I’m retiring from retirement (can you do that?) and buckling down to go back into the steady workforce. So.. I can go back to having hobbies. And comics. And making things for fun. And not working 5 full time jobs to make ends meet. Does that mean I’m giving up on conventions or laser engraving? Hell no. It does mean that I’m not actively seeking conventions for 2016, but if a friend wants to split a booth and I can make it, I’ll be there. 2016 is bringing a lot of changes, and I hope I can continue to share some of them with y’all. Seattle, Calgary, and Mesa, oh my! Holy carp balls, you guys! 4 conventions down and 5 (or more?) still to go! Going full time may have been the best and worst thing I’ve ever done. What else is new this year? Well, geeze, only a LOT. 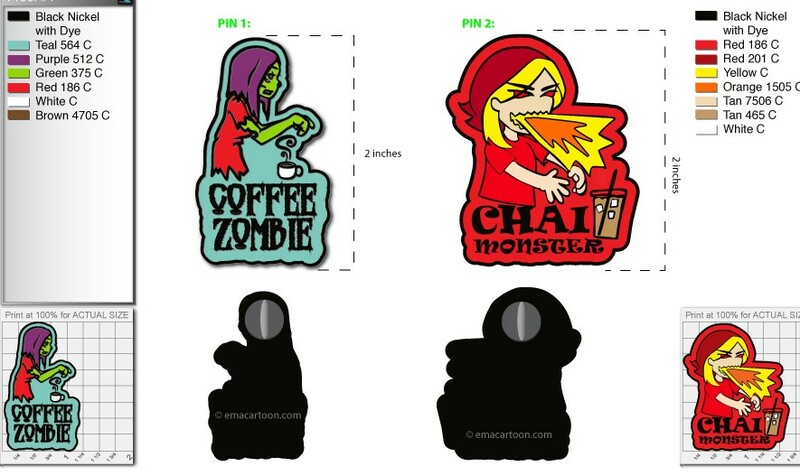 If I haven’t seen you since Intervention Con 4 last August, then you haven’t seen the new plushies, the laser engraved keychains, the Semper Chai buttons, or any of the Chai Monster or Coffee Zombie glasses, all made by me! I also released Chai Monster, Coffee Zombie, Not All Red Shirts are Disposable, and Keep Calm the Childlike Empress Sent Me prints this past weekend at LepreCon. What I’m working on includes swag for Jamie Wyman‘s new book, Unveiled, and its Kickstarter; looking at new methods for mugs (GIANT cappucino mugs? hmm?? ); and another Firefly reference button (because I forgot last year); and male coffee zombie designs! People overwhelmingly love Orion as a zombie, and well, that’s what we’re going with.